Review materials are set to active by default, the main group (1234-FL) which shows the teacher’s name as the only member, is active by default, BUT the 2019 Contest (1234-FL-S) is set to inactive by default. These settings ensure that when students log in, they only have access to review materials and they cannot access the 2019 Contest until you make it active for them. The teacher should sign into ProProfs and select Administration and select the Groups tab. See the “+” and “–“ signs next to the Group. 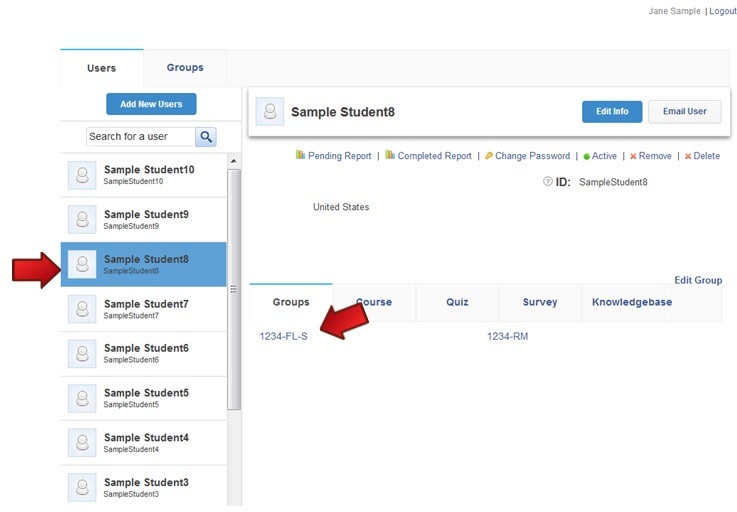 These can be clicked to expand your view to see a student group (school/teacher code followed by level and then “S” for student group below the main level group. When you click on the student group, you see the names of the student in this group. You can tell you are in the student group because the selection turns blue and the student names show up. You can also see at a glance the status of the group – Inactive (students cannot test) or Active (students may take the Contest). Another way to get to the student group screen is to click on the name of a student in the level you would like to activate and then click on the student group. This will bring you directly to the student group where you may activate the group. If you test in two test sessions, please make the Contest inactive at the end of the first test session and re-activate for the second test session. When students finish, make Contest inactive a final time. When the students are done testing, make the 2019 Contest level inactive. Do not activate again to ensure that students do not accidentally access the 2019 Contest again.